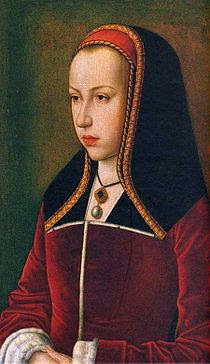 Juana of Castile was the third child of the infamous rulers Ferdinand and Isabella of Spain. Born on November 6, 1479, Juana was immediately betrothed to Philip of Flanders, the Duke of Burgundy, as a political move. Juana’s ambitious parents planned to marry her off in order to build more allies in Europe and strengthen their own ambitions. Juana was groomed by her mother to be a perfect bride. Some historians claim that Juana of Castile showed signs from an early age of being unstable, however the likelihood of this is slim. Isabella of Spain was nothing if not meticulous and cunning; she never would have went through with a marriage if she felt her daughter was going to be unpredictable and dangerous. Juana shows every sign of having been an intelligent and well-behaved child that grew up being pruned to be the wife of Philip the Handsome. In 1496 all the hard work was put to the test as Juana was placed on a ship and sent off to marry Philip in Flanders. Though Juana had left her family she did not have the chance to be unhappy. Upon meeting her groom, both Philip and Juana felt a stirring of lust within in them. Philip in fact insisted on marrying his bride upon her arrival so the marriage could be consummated. The next few weeks seemed to be blissful for the young couple. It was a rare thing, an arranged marriage that resulted in real feelings. Of course, the time and culture dictated that a wife be fully committed to her husband, but the same was not expected of the male. Philip, living up to his title, felt the need to share his male beauty with all the women of the court. Juana of course, felt a tiny sting of jealousy at this. It did not help that she was constantly pregnant, giving birth to six children in nine years. During this time women were confined for a period of their pregnancy. During this time Philip allowed his attention to stray. One such time, Juana caught her husband in his extramarital affair. Juana, giving into her jealousy, attacked the woman, cutting of her precious hair. Today this might be something we put in a movie for a comic effect, during this time however a woman was expected to turn her eyes away and ignore it, especially a princess. Juana however didn’t seem to believe in going along with the crowd and made her point loud and clear; her man was off limits. Of course, a woman making decisions was unheard of in this time, and this is when the rumors of Juana’s ‘madness’ began to circulate. The idea that Juana could be so irrational made many courtiers believe she had inherited the same mental sickness her maternal grandmother was believed to have had. It did not help that Juana’s own husband and father helped to circulate these rumors. On April 12, 1555, Isabella of Castile meant her death. With no living male heir the crown would be passed to her oldest living daughter, Juana. The crown of Castile was eagerly sought after, by Philip of Flanders and by Ferdinand of Aragon. Juana’s own personal ambitions for her country and crown were overlooked. In fact, Juana’s own mind and actions were now her greatest downfall. Her decision to stand up for her vows was the perfect catalyst for her father to launch a campaign to dismiss his daughter and have her locked up, making him once again, King of Spain. It was Juana’s own personal grief that would lead to her downfall. In 1506 the beloved Philip the Handsome died of typhus, leaving Juana pregnant and grief stricken. Juana, still deeply in love with her husband, only made her situation worse. Accompanying her husband’s body for burial, she demanded they only travel at night, to avoid other women who might be tempted by Philip. She also demanded the coffin to be opened so she could see her husband regularly. These actions were all the ammunition Ferdinand needed to rule Juana unfit for the crown. Not wanting to be challenged, it was not enough for Ferdinand to simply deem Juana unfit. He imprisoned Juana in a room with no windows; cutting her off from the thing she loved the most, Philip. Still legally queen, Juana ruled her youngest daughter, who was kept in prison with her, and the windowless tower, where she spent the remainder of her father’s rule. After her father died, her son Charles ascended to the throne, and continued with what his grandfather had begun, leaving his mother to rot in the tower, consumed by her own grief. Juana of Castile was the last queen of Spanish blood to inherit her country’s throne, and she lived her life as a woman ahead of her time in ideas, only to be met with hostility and hatred. She died a sad and lonely woman, abandon by every man in her life she had dared to love. This entry was posted in History and tagged History, Juana of Castile. Bookmark the permalink.